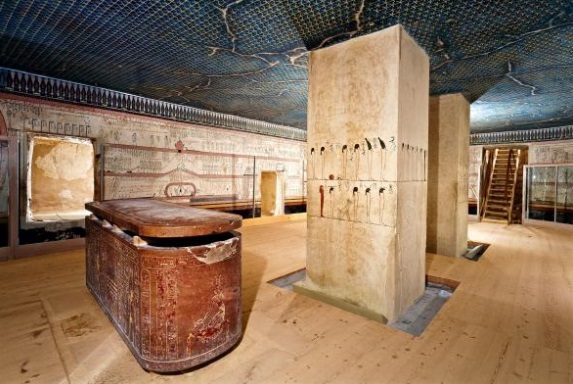 For centuries, Egyptian royalty guarded the sacred rituals that guaranteed divine favor after death, but over time all Egyptians, both rich and poor, could possess its secrets. IN 1842, THE German Egyptologist Karl Richard Lepsius transformed understanding of Egyptian spirituality after he published a collection of ancient mortuary texts. 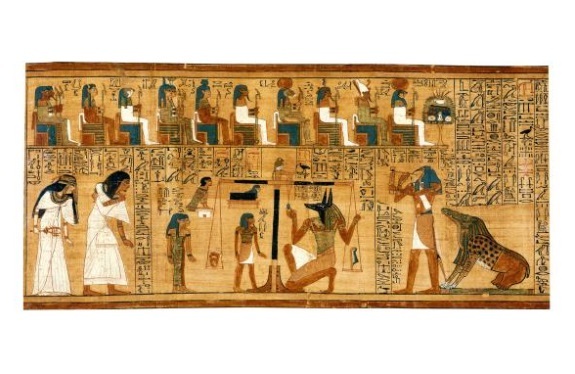 Known in ancient Egypt as “The Chapters of Going Forth by Day,” Lepsius dubbed it the Book of the Dead. Its 200 chapters are a thrilling insight into beliefs about the trials, joys, and fears on the journey into death’s mysterious realm. Objects accompanied the dead on their journey, such as the pectoral depicting Ahmose I, found in the coffin of his mother. Although scholars had known of the magical content of the writings before Lepsius’s publication, his careful ordering of the spells and the assigning of a chapter number to each is the system still used to study them today. However, there is no uniform version of the Book of the Dead. Of the many versions of the spells that have been found, the texts’construction are not exactly alike—yet the arrangement of Lepsius’s publication helped scholars to see this body of work as a more coherent whole. How and when the Book of the Dead first came to be compiled is a mystery. The earliest known example appeared on the sarcophagus of the 13th-dynasty queen Mentuhotep (1633-1552 B.C.). Between the Middle and New Kingdoms, use of the Book of the Dead was no longer limited to royalty. Anyone with enough money to produce or acquire a version of the text could, it was hoped, increase their chances of a smooth passage through the afterlife. 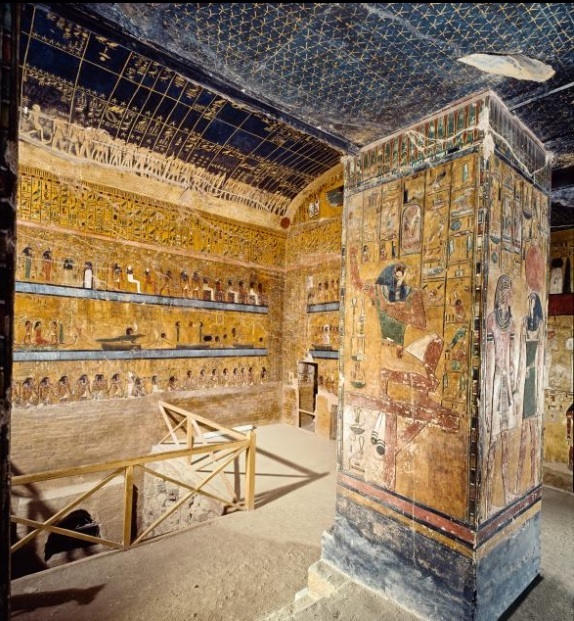 A feast of rich color and detail, the far wall of the exquisite burial chamber of Seti I depicts the journey of the dead pharaoh, as described in the Book of the Dead. 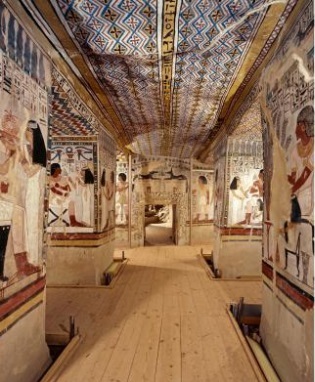 The tomb of Queen Tausert, of the 19th dynasty, is decorated with scenes from the Book of the Dead. Horus, the falcon god and son of Osiris, stands in front. Simple in form, muted in color, the art in the tomb of Thutmose III depicts the defeat of the serpent of chaos, Apep, a key episode of the Book of the Dead. Built for Sennefer, chief nobleman of Thebes, the decorations of this tomb in Sheikh Abd el Qurna depict the tranquil pleasures of the afterlife. 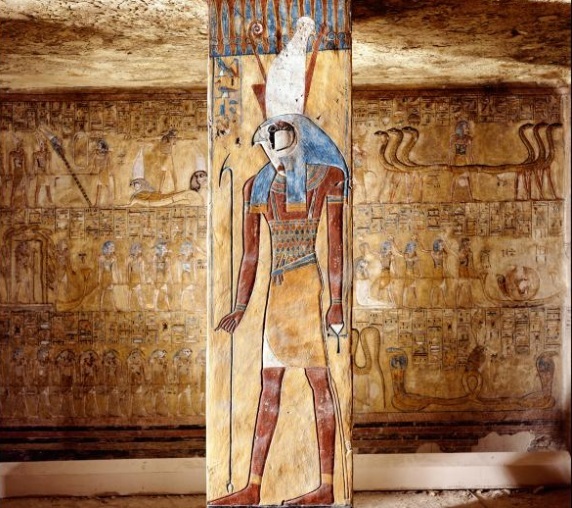 The Egyptians believed that the dead person would embark on a subterranean journey, tracing the route of Re, the sun god. After disappearing with the setting sun in the west, Re passed under the world in a boat to return to his starting point in the east. During this journey, the deceased, aboard Re’s boat, would have to confront ferocious creatures barring the way to their new life. The most formidable of these was Apep, a serpent intent on stopping Re’s boat and bringing chaos to the world. With a total length of nearly 78 feet, the Ani Papyrus is the most complete surviving version of the Book of the Dead. It was produced around 1275 B.C. 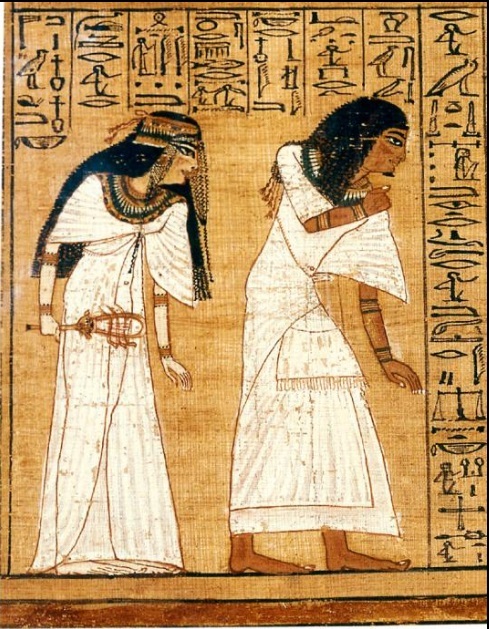 for Ani, the royal scribe of Thebes, and his wife, Tutu, priestess of Amun. It was acquired in Luxor in 1888 by Wallis Budge, who published a translation in 1895. The Ani Papyrus is still held by the British Museum. 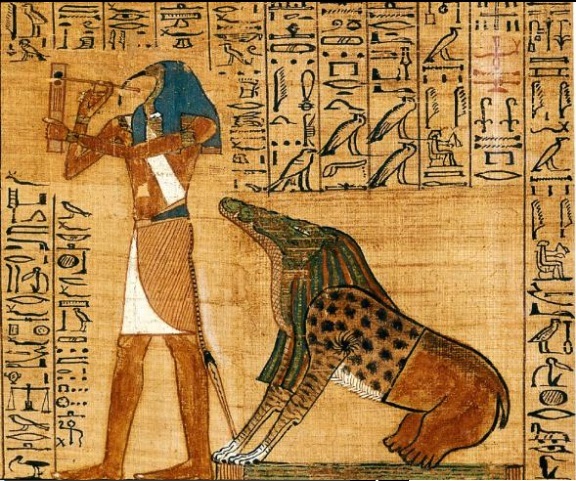 Ani, the royal scribe of Thebes, and his wife humbly stand before Anubis, the jackal-headed god, who will judge their fate. 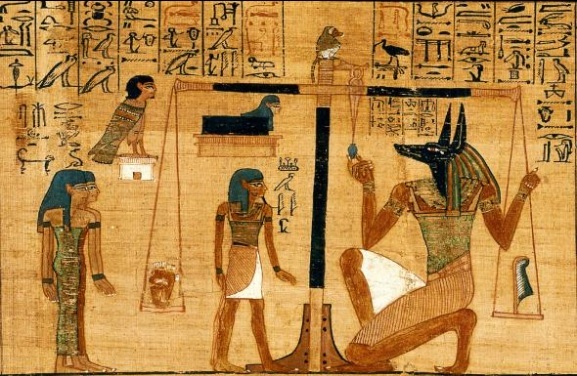 Ani’s soul, represented by a bird with a human head, observes as Anubis weighs Ani’s heart against the feather of Maat, the goddess of balance and justice. Thoth, the god of writing, records the proceedings as Ani and his wife are judged. Behind him sits Ammit, a hybrid of crocodile, hippopotamus, and lion, who will devour Ani’s heart should he fail the test. After the confession came the climax of the trial: the weighing of the heart. Anubis, the jackal god of mummification, held up a pair of scales. In one dish sat an ostrich feather, like that worn by the goddess of justice, Maat, and regarded as a symbol of truth. In the other dish was the dead person’s heart, embodying the actions carried out in their lifetime. If the feather and the heart balanced the scales, the dead person would pass the test. Those whose hearts weighed too much were considered impure and condemned to several horrific fates. The deepest fears of an ancient Egyptian contemplating their lot for eternity are eloquently summarized in chapter 53 of the Book of the Dead. One of the eternal punishments handed down was the prospect of having to eat one’s own excrement: “I detest what is detestable. I will not eat feces, I will not drink urine, I will not walk headdown.” Other dreaded sentences included perpetual hunger and thirst, being boiled, or devoured by a wild beast. To the righteous, on the other hand, the way to paradise would now be opened. The virtuous could look forward to the plains of Aaru, “the fields of reeds.” Not unlike the world they’d left behind, this happy land of the dead abounded with rivers, mountains, and lush, fertile fields in which barley would grow up to five cubits high. It was not, however, an exclusively spiritual paradise. There were physical rewards as well. As chapter 110 of the Book of the Dead reveals, corporeal needs and pleasures were not abandoned once one passed into the afterlife. Many of life’s pleasures—eating, drinking, and copulating, to name a few—existed there as they did in life. Specific meals are mentioned: A passage from the rubric to chapter 125 promises Ashens-cake, a jug of beer, a Persen-cake, and a portion of meat from the altar of the Great God. The Ancient Egyptian civilization, famous for its pyramids, pharaohs, mummies, and tombs, flourished for thousands of years. But what was its lasting impact? Learn how Ancient Egypt contributed to society with its many cultural developments, particularly in language and mathematics. The informations taken from National Geographic website.